This book examines the founding of America from 1607 to 1787. Which group were the real founders – Puritans? Anglicans? Deists? Freemasons? An appendix brings together all the important constitutional documents for the first time. The Freemasonic States of America? Thirteen years before the Mayflower made landfall at Plymouth Rock, another voyage brought a different sort of settler to America’s shores: not the familiar Pilgrims of the schoolbooks, aiming to build their “City on a Hill” around the one true Puritan faith, but a complex company organized by a man named Bartholomew Gosnold, who died just weeks after their arrival, leaving John Smith to chart the colony’s course and claim most of the glory. Now an eye-opening book reveals the hidden history of their community at Jamestown – the first English-speaking settlement in the New World, where Gosnold’s remains are thought to have been unearthed in 2003 – and traces its legacy through to the present day. The Secret Founding of America introduces two groups of founders – the Planting Fathers, who established the earliest settlements along essentially Christian lines, and the Founding Fathers, who unified the colonies with the Declaration of Independence and the Constitution – and argued that the new nation, conceived in liberty, was the Freemasons’ first step toward a New World Order. Drawing on original findings and an in-depth understanding of the political and philosophical realities of the time, historian Nicholas Hagger charts the connections between Gosnold and Smith, Templars and Jacobites, and secret societies and libertarian ideals; explains how the influence of the German Illuminati worked on the framers of the new republic, including Benjamin Franklin, Thomas Jefferson and Thomas Paine; and shows the hand of Freemasonry at work at every turning point in America’s history, from the Civil War, through the Cold War to today’s global struggles for democracy. Carefully researched and compellingly reasoned, The Secret Founding of America brings new insight to bear on four centuries of history – and casts the contours of the American dream in a radical new light. Now, for the first time, this authoritative and accessible book tells the real story. It is a story of struggle, as Anglicans, Catholics, Separatists, Dissenters, and Puritans all vied for control of America – and lost. It is a story of rebellion, revolution and secret currents of power concealed behind a veneer of Christianity, shaping the fate of a nation. raises provocative questions – Were the Templars looking for a new Atlantis? Was the Constitution a Freemasonic coup? Did the Civil War mean decisive victory for the Freemasons? Are today’s leaders under their influence too? draws together all the key documents of America’s origins – as no other book has done – in a single appendix for accessible, authoritative reference. Discover the truth behind the last four centuries of American history, from its genuine founding in 1607. The founding of America is normally associated with the Mayflower bringing the first Europeans in 1620. It was thirteen years earlier, however, that the Jamestown landing became the first permanent English-speaking settlement to survive – and America’s 400th Anniversary to be celebrated in 2007 is based on this earlier date. 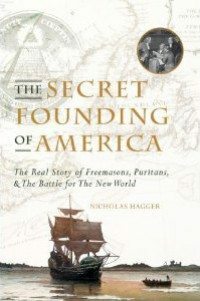 The Secret Founding of America introduces two groups of founders – the Planting Fathers, who established the earliest settlements along essentially Christian lines, and the Founding fathers, who unified the colonies with The Declaration of Independence and The Constitution – and argues that the new nation, conceived in liberty, was the Freemasons’ first step toward a “New World Order.” Drawing on original findings and an in-depth understanding of the political and philosophical realities of the time, historian Nicholas Hagger shows the hand of Freemasonry at work at every turning point in America’s history, from the Civil War, through the Cold War to today’s global struggles for democracy. As America’s 400th Anniversary approaches in May 2007, it’s about time we learnt the real history of our country’s birth…. It’s certainly no secret that the U.S. is the last surviving superpower today. But how did it happen, and was it an accident or all part of a master plan? Leading historian Nicholas Hagger, in his stunning new book, The Secret Founding of America, leads us down a path of little-known national history to how we arrived at the global position we occupy today. Retelling our beloved national stories, such as the founding of Jamestown and the arrival of the Mayflower with all the excitement, struggle, and betrayal that went with it, Hagger paints a picture of our founding as a struggle between religions, monarchies, and political ideas, but with a new twist. Perhaps the U.S. wasn’t founded exclusively on Christian ideals after all; perhaps a secret ideology lay underneath…. Most Americans today would point to our origins as the Mayflower, the Pilgrims, and their Puritanical beliefs. But it’s not so; 13 years before the Mayflower there existed the little settlement of Jamestown, whose anniversary we are officially recognizing this May as the birth of the U.S. In The Secret Founding of America, Hagger argues that this settlement held more influence over the long-term future of America than the Pilgrims’ puritanical beliefs. Jamestown may have contained the first rumblings of Freemasonry in the New World, which Hagger goes on to show influenced each and every one of our Founding Fathers, from Franklin to Washington to Jefferson. The design of our currency and the architecture of Washington, D.C.
Hagger leaves readers with a sense that the rise of America was no haphazard event, but a strategically planned move by Freemasonic groups looking to eventually gain global power and unity. The Secret Founding of America urges us to think more deeply and clearly about the true origins of our country and to where these ideas and secret societies can lead the world. In this fascinating and comprehensive study of the rise of America, readers will be left wanting more and looking towards the future with a fresh and different perspective.